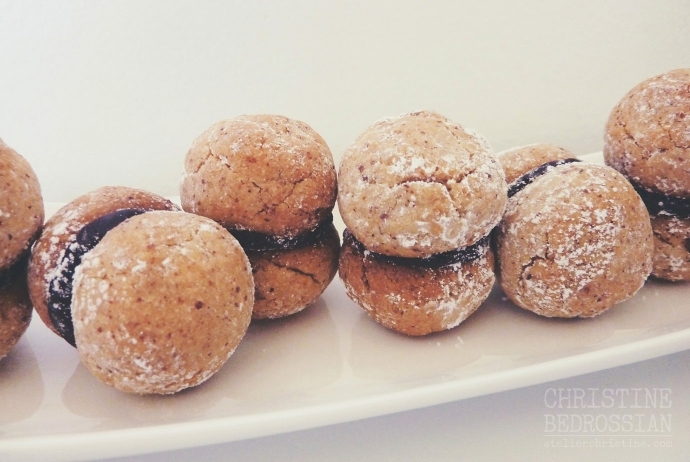 Italian for Lady’s Kisses, Baci di Dama are classic sandwich cookies that first made its appearance in pastry shops in the city of Tortona in Piedmont, Italy. Two butter cookies, made with a mixture of hazelnut and almond meal, are paired together with dark chocolate ganache and finished off with sprinkling a thin layer powdered sugar. Toast hazelnuts in a 300F-to-320F preheated oven, for about 15 minutes, until browned and skins are peeling away. Remove loose skins by rubbing the nuts with a clean kitchen towel. Once cooled, completely grind in a food processor to a fine sand consistency. In a medium bowl, combine ground hazelnut, almond meal, pastry flour and sea salt. In another small bowl, lightly whisk together egg yolk and extract if using. Set both aside until ready to use. Using the paddle attachment cream th butter and sugar until light and fluffy. With the motor still running, gradually add in flour mix. Slowly add in egg yolk – dough should be smooth and hold together; if too crumbly, knead with slightly wet hands. Divide cookie dough into four parts and roll each into a 3/4”-thick log. Chill the logs by refrigerating them for at least 2 hours. Preheat oven to 325F-to-338F and line baking sheets with parchment paper. Once dough is completely chilled, transfer logs out of the refrigerator, one at a time, and cut into 1/2″-long pieces. Roll each piece, by pressing to keep dough together, into a smooth ball and arrange on prepared baking sheets. You will end up with 60 pieces. Bake the cookies 13-to-23 minutes, rotating pans, until light golden brown. Cool completely in pans. Prepare ganache. Gently heat cream to a slow simmer then add chocolate pieces. Remove from heat. Let stand a couple of minutes then gently stir until chocolate completely melts and you have a homogenous mixture. Cool slightly, stirring every so often, until the chocolate ganache is thickened to a piping consistency. Once the ganache is ready, use a pastry bag and pipe a dollop of chocolate onto the bottom of one cookie and sandwich together another cookie – this recipes makes 30 sandwich cookies. Arrange sideways on a rack and set aside until chocolate is firm. Store at room temperature, in an air-tight container, for up to 5 days. Dust with powdered sugar before serving.